Italian poet of the fourteenth century. He earned a livelihood by giving lessons in poetry and by writing occasional poems; but none of his poetical productions has been preserved. He composed a riming dictionary, preserved in manuscript at Oxford and Rome (Neubauer, "Cat. Bodl. Hebr. MSS." No. 1530; Michael, "Or ha-Ḥayyim," No. 1163). 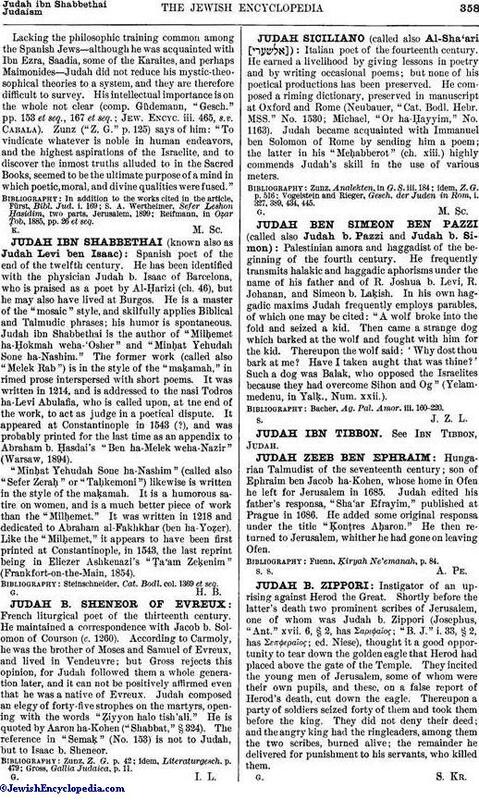 Judah became acquainted with Immanuel ben Solomon of Rome by sending him a poem; the latter in his "Meḥabberot" (ch. xiii.) highly commends Judah's skill in the use of various meters. Vogelstein and Rieger, Gesch. der Juden in Rom, i. 327, 389, 434, 445.